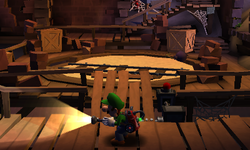 The Roundhouse is an outdoor area of the Old Clockworks in Luigi's Mansion: Dark Moon. The first floor of the Roundhouse is accessed by taking north door on the first floor of the Warehouse or by taking the west door on the second floor of the Canyon Stairs. The second floor of the Roundhouse is accessed by taking the north door inside of the Clockmaker's Chambers. The Roundhouse is an abandoned minecart facility. The first floor features a turntable with a track that can be moved. A chain lowers the ramp so that access can be granted between both sides of the Roundhouse. Several tracks of railing are still present, but are bent and unusable. There are crates and bricks littering the turntable. The flooring on the second floor is broken, leaving only thin metal bars that Luigi can walk across. On the first floor, the door to the right leads to the Canyon Stairs while the door on the south takes Luigi to the Warehouse. On the second floor, the door to the north and the west leads back to the Transportation Hall while the door on the south leads back to the Clockmaker's Chambers. Starting from Roundhouse Brawl, after Luigi crosses the metal bars to reach the other side of the second floor of the Roundhouse, there is another set of metal bars going south. Taking this route takes Luigi to a Treasure Chest that contains a ruby. This page was last edited on September 16, 2017, at 02:53.